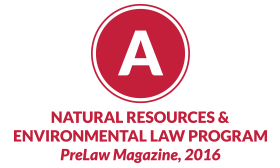 The Natural Resources and Environmental Law Program at the UNM Law School received an “A” rating in the winter issue of preLaw magazine. UNM’s Natural Resources and Environmental Law Program is recognized for its robust curriculum, a certificate program, and experiential opportunities for students. A variety of specialized courses are offered in natural resources, environmental, tribal resources, and energy law. The curriculum includes regular courses as well as seminars and lectures on current topics such as toxic water contamination crises, proposed rulings from the EPA, and wildlife issues. The Certificate Program includes law school courses and electives in related graduate courses offered through UNM, such as biology, economics, civil engineering, geography, geology, political science, public administration, architecture and planning, and the Water Resources Program. Hands-on opportunities include externships with state or federal agencies, nonprofit groups, judges, and at the UNM Law School’s Utton Transboundary Resources Center. Throughout the year, the Utton Center brings in speakers, conferences and networking opportunities for students. The Environmental Law Society is an active student organization offering a variety of events and activities. The Natural Resources Journal, a student-run publication, is the oldest U.S. law review in the field of natural resources and environmental law. UNM Law students participate each year in the national environmental moot court competition; in 2015, the UNM team advanced to the quarterfinals and received honorable mention for Best Oralist.